28 years of experience in managing civil and mining engineering projects, domestically and internationally, from preliminary planning stages through project closeout. Contact Lali directly. Join mining’s most respected and active mining community. As Project Construction Manager, performed construction management and oversight of contractors and subcontractors for expansion of tailings dam, relocation of tailings and reclaim piping and installation of geosynthetics. Project included organization and coordination of Construction and Process during the construction stage and commissioning. Responsible for implementation of site safety/environmental regulations and procedures, monitoring of QA/QC activities, along with daily and weekly summary report …[+] ing on construction status and progress. As Project Construction Manager, performed construction management and oversight of contractors and subcontractors for construction of HCCUEP Decline Project Portal Pad, Soil Nail Wall and Portal entrance. Project included detailed design management, planning, budgeting, bid package review and bid analysis, and project organization and construction oversight. Responsible for close liaison with contractors, subcontractors and owner’s representatives during construction period, implementation of site safety/environmental regulations and procedures, monitoring of QA/QC activities, along with daily and weekly summary reporting on construction status and progress. As Project Construction Manager, performed construction management and oversight of contractors and subcontractors for construction of the North Block Stage 10B; installation of embankment zones, installation of geosynthetics and relocation of existing tailings & reclaim piping and electrical and mechanical infrastructures. Project included assistance in preparing of bid documents (SOW, bid schedule etc. ), analysis of the contractor bids during the pre-construction stage with coordination and management of Construction and Process during the construction stage. Responsible for implementation of site safety/environmental regulations and procedures, monitoring of QA/QC activities, along with daily and weekly summary reporting on construction status and progress. As Project Manager, managed project feasibility study, budgets for staged development plan and preparation and submittal of authorization for expenditure (AFE) for each stage. Managed conceptual design for permitting approvals, staged detailed designs, planning, budgeting and procurement. Performed project organization, construction and commissioning oversight for TSF and associated mechanical and electrical components. Construction of facility included foundation and embankment construction consisting of approximately 300 acres of the embankment foundation construction and over 40 million tons of embankment compacted random fill installation. Approximately 3,000 linear feet of concrete encased high-density polyethylene (HDPE) underdrain pipeline infrastructure installation and construction of solution storage ponds with the associated electrical and mechanical components. Project also included site power study, new power design management, installation of approximately 6 miles of 25 and 5 kV overhead powerlines with substations, and upgrades to existing Booster Pump House Systems. Other responsibilities included close liaison with operations and maintenance groups during construction and commissioning of facilities, implementation of site safety/environmental regulations and procedures, monitoring of QA/QC activities, along with weekly and monthly summary reporting on construction status and progress. As Project Manager, managed budgets for project execution and preparation and submittal of authorization for expenditure (AFE), engineering, planning, procurement, and construction oversight for construction of approximately 7,000 linear feet of HDPE-lined containment channel from Mill Process Area to Booster Pump House and replacement of approximately 60,000 linear feet of Mill tailings and reclaim solution pipelines. Project included design and construction of emergency catch ponds with associated mechanical and electrical facilities. Other responsibilities included close liaison with operations and maintenance during construction, planning and coordination of Mill shutdowns for tie-ins and commissioning of facilities, implementation of site safety/environmental regulations and procedures, monitoring of QA/QC activities, along with weekly and monthly summary reporting on construction status and progress. As Project Manager, prepared and submitted authorization for expenditure (AFE) for management approval. Managed budgets and engineering designs for permitting. Managed detail engineering and procurement for construction. Prepared tender package and managed tender process through the award of the contract. Performed construction and commissioning management. Responsible for close liaison with operations and maintenance during construction, planning and coordination of process shutdown for tie-ins and commissioning of facilities. Responsible for implementation of site safety/environmental regulations and procedures, monitoring of QA/QC activities, along with weekly and monthly summary reporting on construction status and progress. 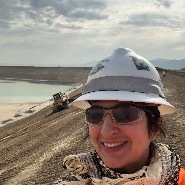 As Project Construction Manager, performed detailed design management, planning, budgeting, reporting and construction and commissioning management for West tailings expansion. Project consisted of construction of massive embankment fills, construction of embankment low permeability seal zone, preparation of approximately 300 acres of basin subgrade and installation of approximately 13 million square feet of HDPE geomembrane liner with geocomposite sub-liner on embankments and approximately 600 linear feet of concrete reclaim ramp with associated process piping, mechanical, electrical and motor control center. Project included design management, procurement, and construction of Booster Pump House (installation of concrete foundation, structural steel, HVAC, tailings pump system, piping, instrumentation and process monitoring systems). Prepared commissioning plan and managed commissioning and transfer into operation of new Booster Pump House and Reclaim Ramp systems. Other responsibilities included close liaison with operations and maintenance during construction and commissioning of facilities, implementation of site safety/environmental regulations and procedures, monitoring of QA/QC activities, along with weekly and monthly summary reporting on construction status and progress. Performed Civil Works Superintendent duties responsible for all facets of the project. Project consisted of construction of various facilities for the new mine development including ore crusher, overland conveyor, truck shop, fueling stations, process and administrative buildings, electrical substations, etc.. Other responsibilities included close liaison with EPCM Company, contractors and owner’s representatives throughout the construction and commissioning of facilities, along with weekly and monthly summary reporting on construction status and progress. As Project Construction Manager, performed project construction management oversight for installation of process CIL tanks, including concrete ring walls for CIL tank foundations and concrete containments. Other project duties included management of construction budgets, estimates, schedules, implementation of site safety/environmental regulations and procedures, monitoring of QA/QC activities, weekly and monthly reporting on construction status and progress, and close liaison with operations and maintenance during the construction and commissioning of the facilities. AMEC Earth & Environmental acquired Smith Williams Consultants, Inc. (SWC) in July 2008.